Explore the landscapes, flavours and character of rural South Korea on this off-the-beaten-track cycling holiday. Visit historical temples, cycle scenic coastlines and stop at sleepy fishing villages along the way. Seoul - South Korea's present-day capital, one of the world's great and fast-changing modern metropolises. Arriving in Jeju today we will transfer a little out of Jeju City to our hotel, in a lush landscape between spectacular beaches and the imposing Hallasan volcano. Jeju is a volcanic island home to some of South Korea's most beautiful coastal landscapes. Formed, as legend would have it, by a mystical grandmother shovelling dirt, and whose sons, turned to stone in grief at her death, form the 360 parasitic cones around the central Mount Hallasan shield volcano. Jeju has seen recent increases in popularity, although very few European visitors make it to the island. Jeju is perfect for coastal and country cycling where travelling by bicycle enables us to see the best of the island, enjoying relaxed riding whilst dipping into some of Jeju's many impressive historic and geological sites. This morning, after collecting and fitting our bikes, we will ease slowly into our cycling, enjoying a day riding along Jeju's coastal bike path to the white sand beach and cobalt sea at Hyeopjae Beach, continuing through the potato fields to a prominent headland, offering impressive views of Mount Hallasan and the neighbouring islands. We visit the temples at the foot of Sanbangsan mountain, each with its own character in murals, statues and Chinese characters. From here, we wind through the jagged headlands to the quirky artistic town of Seogwipo, staying on a peaceful seafront out of town where the old lava flows tumble into the sea. Taking in the colourful seaside scultpures through town, the coastal road through Seogwipo enjoys natural wonders en route - where we may stop to see the famous Oedolgae Rock or Jeongbang Waterfall. You might even see a Korean pop (K-pop) celebrity on holiday, before we continue eastwards across the picturesque Soesokkak Estuary. Next we cycle to Jeju's Folk Museum and discover more about the stone harubangs (statues) that have guarded the island since the eighteenth century. Continuing northwards, we ride on a narrow causeway to Seongsan, where the sheer sides of the vast volcanic plug of Seongsan Ilchulbong rise from the sea, overlooking the Haenyo grandmothers freediving for seafood. An impressive sunrise over the sea is usually the reward for those who rise early to hike the volcanic peak of Seongsan Ilchulbong. Our ride continues westwards through the coastal wetlands, rich with local bird life, and dipping inland to explore the spectacular lava tubes at Manjanggul Caves - watch out for the natural 'Stone Turtle' in the shape of Jeju Island. Approaching Jeju City from the north, we will wind through the small coastal settlements alongside Jeju's traditional stone walls, where Borimsa temple, damaged and rebuilt following the 1948 Jeju uprising, is juxtaposed against the bustling modern day port below the hillside cycle path. We spend the night in Jeju City. 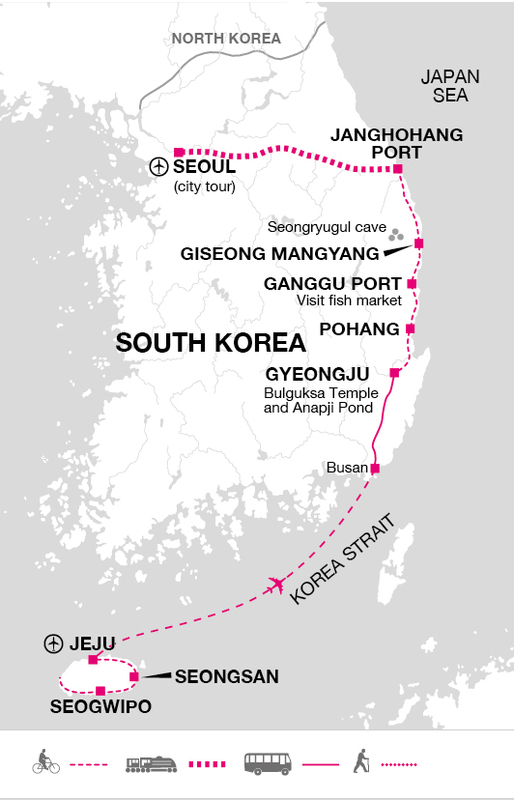 Today we enjoy a rest day from cycling, flying from Jeju to the mainland at Busan, Korea's second city, before a short drive to the historic city of Gyeongju, once capital of the ancient kingdom of Silla. In the afternoon, we will explore the UNESCO World Heritage site of Bulguksa Temple, an important site for Korean Buddhists, and home to seven of Korea's designated 'National Treasures' from the golden age of Buddhist art. Although historically Buddhism was the principle religion, according to the 2015 census the majority of South Koreans have no formal affiliation with religion. In the evening, we will relax in the beautiful night-time scene at Anapji Pond, before experiencing our first night in a traditional Korean house or hanok. The rooms are twin share with full bedding provided, with every two rooms sharing one shower room and toilet. Setting out from Gyeongju, today we experience the scenery and landscapes of Korea's inland hills and valleys - riding across the wide rivers and through the rice and wheat fields, we will arrive in the tradtional folk village of Gyeongju Yangdong, before taking back country lanes to our overnight destination of Pohang, famous for its spectacular golden sand beach and corniche. Riding northwards along the scenic coastal road, we will enjoy peaceful cycling along quiet coastal roads and bike paths, under impressive cliffs and through traditional fishing villages, before arriving in Ganggu Port, famed home to both Korean classical scholars, and a thriving crab industry - already famous over one thousand years ago in the Goryeo dynasty. Here, enjoying the view to the mountains and the Sea of Japan, we will wander the fish markets and enjoy the traditional delicacies on offer in the town's many local seafood restaurants. From Ganggu Port, we will continue along the peaceful east coast cycle path to Hupo. We leave the bikes along a beautiful covered lakeside walkway under the cliffs, to venture underground for the impressive stalactites, stalagmites, caverns, passages and rock formations of the limestone caves at Seongryugul. Back in the open air, we follow the coastal road past golden sand beaches and coastal wetlands to our beachfront accommodation in the small hamlet of Gisyeong Mangyang. Our final day of cycling, past old military fortifications and observation posts, will see us continuing up the east coast to the beautiful rock formations, crystal clear water and enclosed bay of Jangho Port, known as 'the Naples of South Korea', where we will enjoy our last night on the coast overlooking the fishing port and white sand beach of the bay. An early start from Jangho Port will see us catch a fast train (approx. 2.5hrs) from Gangneung to South Korea's capital Seoul, home to approximately a fifth of the country's population, and where a fast-growing economy and rapidly improving quality of life contribute to a fascinating time for Korea's social and cultural development. With a history stretching back over two thousand years, the city boasts impressive modern architecture and public services, alongside traditional temples and mountains that rise out of the urban districts. After enjoying a brief sightseeing tour and a free afternoon's shopping, we will enjoy a farewell meal together in a traditional Korean restaurant. Korean food is full of flavour and variety with many interesting dishes, stews and colourful, intricate deserts. Meals are very healthy; largely based on rice, supplemented with vegetable and meat side dishes and usually accompanied by Kimchi, fermented cabbage. Tonight let your tour leader guide you through the menu and perhaps try something a little more unusual. The tour ends this morning after breakfast in Seoul. General: Pack essentially for hot or mild weather depending plus some warmer clothes for cooler nights. You may want to pack a swimsuit and towel, as there will be some opportunities to swim. If you are not bringing cycle shoes then try to bring stiff-soled shoes as these are better for cycling - transmitting your energy into the pedals more efficiently. This becomes more relevant and recommended the more demanding the grade and distances to cover. Comfortable shoes, trainers, sandals or flip flops are useful when not on the bike. On all Explore cycle holidays we strongly recommend you bring along and wear your cycle helmet. In case of an accident resulting in personal injury, certain insurance policies are invalidated in cases where a helmet was not being worn. Cycle glasses to protect against dust, pollen and the sun, padded cycle gloves and a water bottle or water delivery system (e.g. camelback or platypus) are also useful. You may choose to bring your own gel seat cover for added comfort. Other items to consider bringing are a sunhat and sun cream, torch, earplugs and insect repellent. 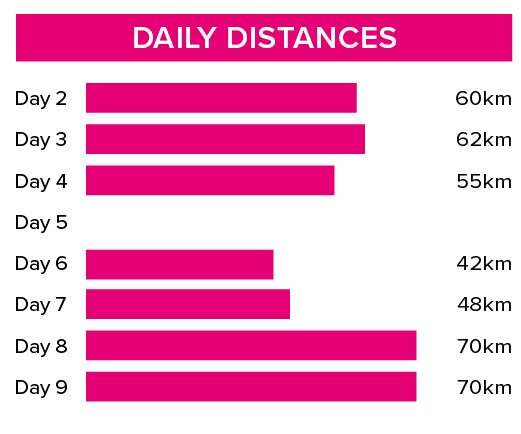 On this tour we cycle 407 km over seven days (an average of 58 km per day). We cycle mainly on paved bike paths (95%) and quiet country roads. The terrain is relatively flat on the coastal sections, with the occasional hillier stretches as we turn inland on Jeju. A support vehicle accompanies the riders throughout the tour. We have graded the route as moderate. This trip is graded as moderate - but your comfort and enjoyment will be considerably improved by undertaking some training prior to the trip. We recommend comfortable completion of at least three rides of 70km on flat and moderately hilly terrain in the weeks leading up to the trip. Your included bike is a 24 gear Giant ToughRoad bike or similar hybrid bike and will be the correct frame size for your height. There is the facility to fit your own pedals or saddle if you wish to bring them. As close as possible to the bike paths, a support vehicle accompanies the rides throughout. We provide spare parts and take care of the day to day maintenance. All you need to bring is your own helmet.